The Dallas Cowboys parted ways with veteran quarterback Kyle Orton on Tuesday afternoon, ESPN's Adam Schefter confirmed. Orton was the last of Denver's 2011 quarterbacks to play in the NFL, backing up Tony Romo in Dallas over the last two seasons. Orton did not want to play football this season and told the Cowboys he was planning to retire. Dallas acted before Orton had a chance to retire, choosing to release the 31-year-old quarterback. Brandon Weeden will now serve as the reserve QB in Dallas. 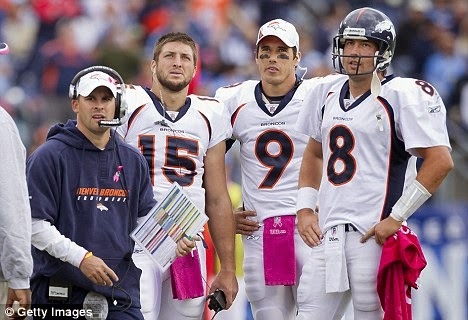 Orton, who was acquired by former head coach Josh McDaniels in 2009, began the 2011 season as the Broncos' starter. Under new head coach John Fox, Orton led Denver to a 1-4 start going into their bye week. During the bye, second-year QB Tim Tebow jumped Brady Quinn on the depth chart and started in Week 7 against the Miami Dolphins. Tebowmania ensued as Tebow helped the Broncos finish the season with an 8-8 record, winning the AFC West. Ironically, Tebow's final start of 2011 came against Orton, who was waived by Denver several weeks earlier. After signing with the Kansas City Chiefs, Orton returned to Denver and defeated Tebow 7-3. Despite the loss, the Broncos still clinched their division and advanced to knockoff the Pittsburgh Steelers in a thrilling Wild Card playoff game before going on to lose to the New England Patriots 45-10 a week later. The following offseason, team executive John Elway signed free-agent quarterback Peyton Manning to a five-year deal, marking the end of Tebowmania. Tebow was traded to the New York Jets, where he played one season before being released. Tebow went to camp with the New England Patriots in 2013, but did not make the team's final 53-man roster. Orton, meanwhile, spent the last two seasons as a backup in Dallas. Quinn spent time with the Chiefs, Seattle Seahawks, Jets, and St. Louis Rams since being cut by Denver in 2012. Quinn, 29, is currently a free agent. Tebow signed on with ESPN in December to begin working as an SEC Network analyst this fall. Quinn is hoping to catch on with a new NFL team, and Orton is primed to retire. Manning, 38, is the early favorite to win the league's MVP award again this fall.